PowerClick is small utility that provide you with fast access to, all commonly used, power managment features available in Windows. Those are shutdown, restart, standby, hibernate, log off and station lock. With PowerClick you can force all programs to close before shutdown or restart, which is sometimes quite usefull. Similar programs exists, but some of them are as big as one megabyte or even more, which is absolutely unnceessary overhead! Windows will refuse to close is some programs are running, so you would have to close every application, one at the time, which can be quite annoying. 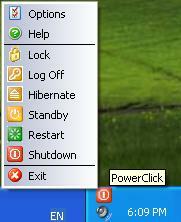 With PowerClick you can force all programs to close before shutdown or restart, which is sometimes quite usefull. You don't have to wait until all programs are closed, you can invoke shutdown and leave the desk with assurance that system will be properly turned off. It is all done automatically. Similar programs exists, but some of them are as big as one megabyte or even more, which is absolutely unnceessary overhead for such an simple application! Lets keep it small and simple. Just click it and leave it! Qweas is providing links to PowerClick 1.2 as a courtesy, and makes no representations regarding PowerClick or any other applications or any information related thereto. Any questions, complaints or claims regarding this application PowerClick 1.2 must be directed to the appropriate software vendor. You may click the publisher link of PowerClick on the top of this page to get more details about the vendor.